A British icon since 1889 - the Savoy Hotel in London retains stunning English Edwardian and Art Deco interiors sparkle with timeless elegance and glamour. Not everyone''s idea of a B & B but it certainly makes a great subject for this Janet Ledger painting. 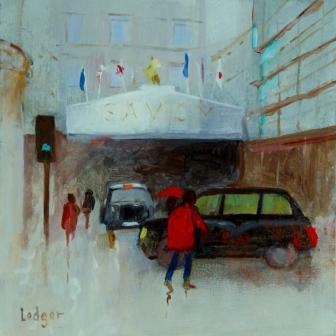 In addition to Red Rag British Art Gallery Janet Ledger has exhibited at many other leading British Modern Art Galleries. Each painting at Red Rag is sourced from the Janet Ledger artist studio and like all Red Rag Modern art and Contemporary art it can be shipped worldwide.